Interested in increasing water productivity while saving money on water and energy bills? Considering cover crops, composting or planting a hedgerow? Would you like to convert from flush to scrape at your dairy/livestock operation? 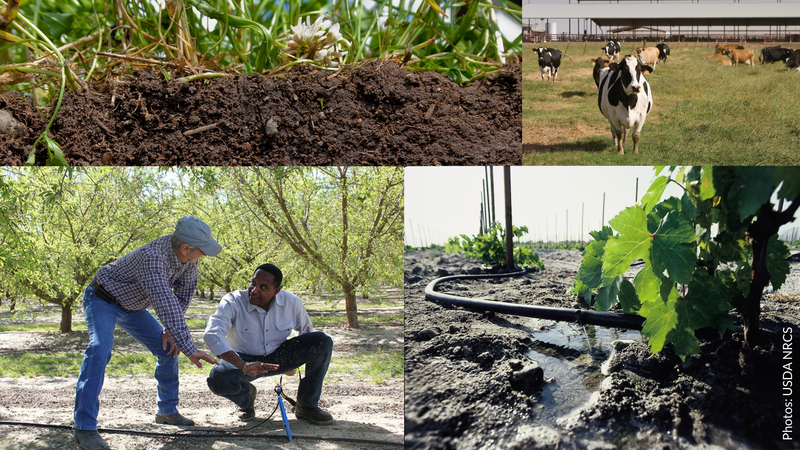 Applications are now open for three grant opportunities through the California Department of Food & Agriculture (CDFA). Funding is available to farms and ranches for a variety of practices that can cut on-farm water and energy use, build soil fertility and reduce dairy methane and other greenhouse gas emissions, while providing economic benefit to the operations and enhancing community and environmental health. Below are some examples of eligible projects for each program. To delve into the specifics of each program and how to apply, please see the CDFA website links to each program below. Share the SWEEP application flyer! Share the Healthy Soils Program application flyer! Share the AMMP application flyer! Pasture based practices, including conversion to pasture and increased time animals spend on pasture. Matching grants from programs like USDA’s NRCS EQIP are encouraged for AMMP and the Healthy Soils Program, but not required (EQIP match not permitted for SWEEP). Some funding will be prioritized for awards to socially disadvantaged farmers and ranchers, consistent with the Farmer Equity Act (AB 1348). CDFA will also give special consideration to projects located within or that show demonstrated benefits to severely disadvantaged communities (you can use this site to find out if you are located in such a community). Read our recent blog for more information about these funding priorities. Go to CDFA’s websites, linked above, for more detailed information and access to the applications. Please share this blog with any relevant networks. Assist with outreach by distributing the package of flyers, prepared by CalCAN, to producers and agriculture professionals to let them know about the programs and current funding opportunities.